A still from Ru Ba Ru. Director Arjun Chandramohan Bali's Ru Ba Ru tries to portray what happens in a relationship when you do not express your love to each other from time to time. As Randeep Hooda and Sahana Goswami go through the motions on screen, you may sense a feeling of deja vu if you have watched the Hollywood film, If Only, starring Jennifer Love Hewitt [Images]. Ru Ba Ru revolves around a live-in couple -- Nikhil (Randeep Hooda) and Tara (Sahana Goswami), who have been in a relationship for two years. Nikhil, an ambitious young man working in an advertising firm, has no time for Tara, an aspiring actress and singer. She soon gets fed up, and decides to leave him. But then, something happens and changes their lives forever. Even though the film is short at two hours, it soon gets boring. The film drags, and how! People in love may related to the film, and that may be one of the few things that work in the film. After the interval, the film becomes a psychological thriller. By the climax, it ends up being an abstract take on fortune and fate. The news-making steamy scenes the two share, thankfully are in sync with the story and not blown out of proportion. Sahana recreates her Rock On! magic and does well. 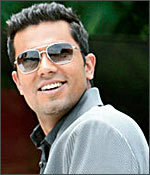 Randeep seems to be stuck with his action hero image from D and Risk, but his efforts to play a romantic hero shows. Still, there is room for improvement, especially in the romantic scenes and dialogue delivery. Rati Agnihotri [Images] and Jayant Kriplani have insignificant roles and are quite wasted. Kulbhushan Kharbanda, playing a Punjabi cabbie, is supposed to play a vital role but is not up to the mark. The music is nothing to write home about. As for the screenplay, it adopts an informal approach, but ends up being bland and boring. If you go without expectations, you may just like it.